This coffee cake is super ultra delicious. The sour cream makes it so moist and adds great flavor. A mixture of sugar and cinnamon adds texture to the top of the cake with a bit of a crunch. And the yumminess of the cinnamon and sugar is in the middle of this cake too. 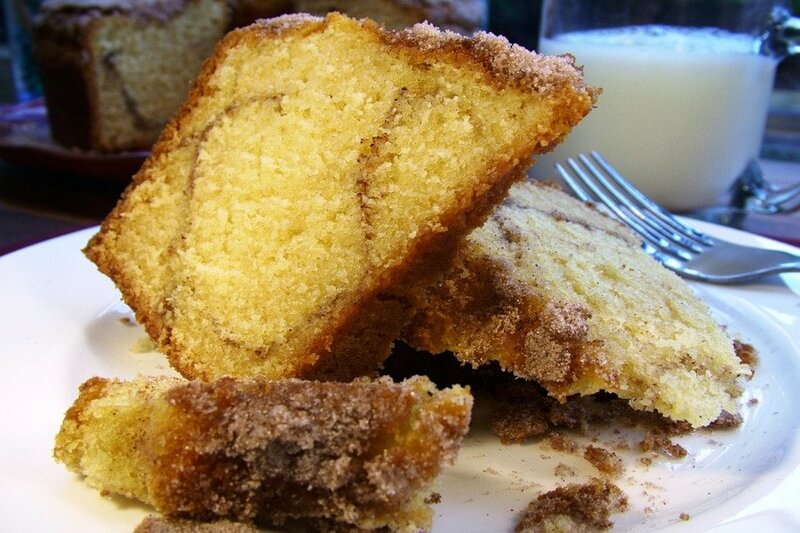 Enjoy this coffee cake in the morning for breakfast or as a dessert. Or even for dinner. Let’s just say it’s delish anytime. Grease the angel food cake pan with butter. Add the flour, sour cream, eggs, baking powder, baking soda, and vanilla. Beat on low speed until blended. Then beat for 3 more minutes. Pour ½ of the dough mixture into the angel food pan to form the first layer. Use a spatula or spoon to level off the mixture in the angel food pan so it’s flat. In a small bowl, mix the cinnamon and sugar for the topping and filling. Sprinkle half of the cinnamon and sugar mixture evenly over the top of the dough in the pan. Then pour the remaining dough mixture into the pan to form the second layer. Use a spatula or spoon to level off the dough mixture so it’s flat. Sprinkle the remaining cinnamon and sugar mixture evenly over the top of the second dough layer (the cinnamon layer should be on the top). Bake 60 to 65 minutes. To test for doneness, stick a toothpick into the cake and if it comes out without cake batter on it, then the cake should be done. This cake tends to dry out so leave it a little moist. Let the cake cool completely. Removing the cake from the angel food cake pan can be tricky. For best results after the cake is cool, hold on to the middle funnel section of the pan and pull it from the outer part of the pan. Run a long knife under the bottom of the cake to loosen it from the cake pan. Then you should be able to lift the cake from the pan onto a cooling rack if it’s still warm, or a plate or serving dish. 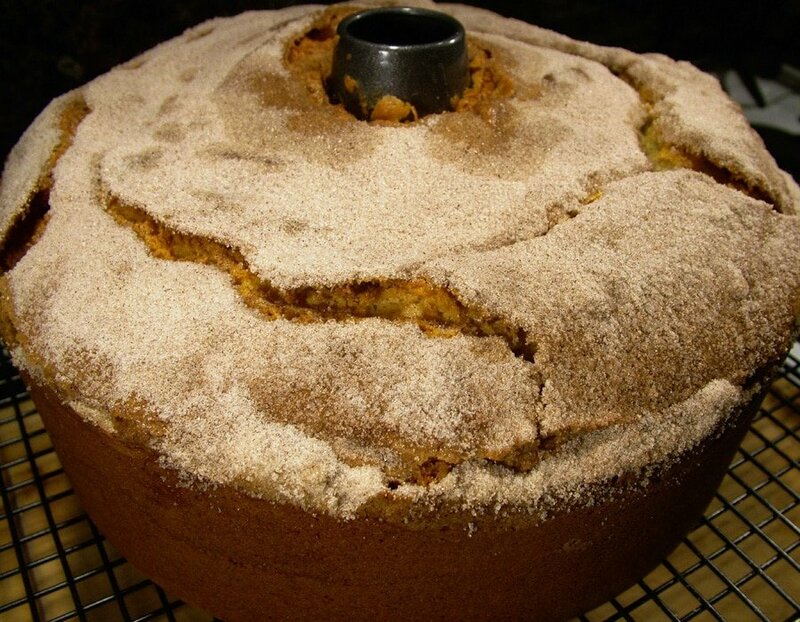 This cake is made in an angel food cake pan. Pour ½ of the dough mixture in the angel food cake pan to form the first layer. Then take a spatula or spoon to level off the mixture in the angel food pan so it’s level. In a separate bowl mix the cinnamon and sugar for the topping and filling. Sprinkle half of the cinnamon and sugar mixture evenly over the top of the dough mixture that's in the pan. Then pour the remaining dough mixture into the angel food pan to form the second layer. And level the mixture with a spatula or spoon. Sprinkle the remaining cinnamon and sugar mixture evenly over the top of the second dough layer (the cinnamon layer should be on the top). Bake 60 to 65 minutes. To test for doneness, stick a toothpick into the cake. If the toothpick comes out without cake batter on it, then the cake should be done. This cake tends to dry out so leave it a little moist. Let the cake cool completely. Removing the cake from the angel food pan can be tricky. For best results, after the cake is cool hold on to the middle funnel section of the pan and pull it from the outer part of the pan. Run a long knife under the bottom of the cake to loosen it from the cake pan. Then you should be able to lift the cake from the pan onto a cooling rack if it's still warm, or a plate or serving dish. Wonderful blog, with such a huge collection of recipes!! I must pay a visit to your blog very soon! Hi Purabi, thank you for visiting!